It is not lost on me…that I update this status…this instant communication available world-wide at the touch of a button…from a room that looks pretty much as it did in 1900. 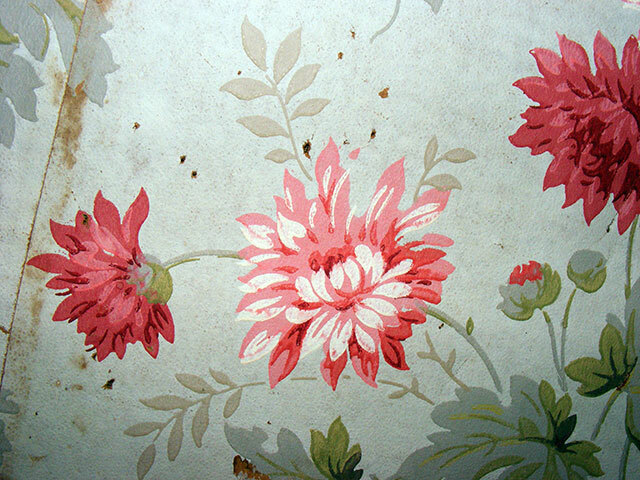 The wallpaper is original…as it is in several rooms in this house…we must update it…as over 115 years of age has destroyed the color and integrity of the paper and glue. Occasionally a piece drifts down from the ceiling with a quiet whisper…annoying the cats and delighting the dog…who…as best as I can tell…loves the taste of the stuff. The paper is so fragile that if I slap the wall the paper will shatter and blow small pieces back in my face. The original floors…with the original finish…complimented by gorgeous trim, bulls-eye moldings, and antique cabinets complete the atmosphere. A visitor from the past, suddenly transported here…would not immediately feel out of place. But there are differences…and the hypothetical visitor from the past would marvel and rejoice at them. The room is brightly…and pleasantly lit…by extraordinarily efficient and latest generation of high-tech LED electric light-bulbs. For you “incandescent” purists…the color/brightness are indistinguishable and they come on to full brightness immediately. For you “oil-lamp” purists…well, you’re out of luck. I think you can get the appropriate color/wattage, but no matter how hard you try, they won’t make soot. My visitor would gasp at the flip of the switch. As best as we can tell this house didn’t get electricity of any kind until around 1930. There are more operational bulbs in this single room than the entire house was equipped with when electricity was first installed. They provide more light for a fraction of the power too. Oil lamps, candles, and the ample 8-foot tall windows would have had to do before. Given the nature of the wall and ceiling coverings…it’s a wonder any of these homes survived the “flame on” lighting era. Despite the oppressive heat and humidity outside, the room is pleasantly cool and dry. Were it not, the shellac finish on the 100 year old table I’m using would be too soft and sticky to set anything on (yes, it’s that swampy out there). My visitor would again marvel. This is due to a small, nearly silent, latest technology, high efficiency heat pump, mounted unobtrusively high on the wall in each room. These use less than 1/3rd the power of similar capacity of cooling just a decade ago would require, and cost less to heat with in our climate than natural gas. This room is more comfortable now…at this moment…than it’s ever been in its 115(ish)-year history. Modern day purists…the ones that think this home is a museum, would no doubt criticize. In the past, properly deployed double hung windows all over the house would catch the breezes and draft some of the heat out of the house. Those that can say that with a straight face have never visited our part of the country. Close to 8 months out of the year the heat and humidity are enough to cause discomfort at best, distress for some, and death for others. When it’s 100 degrees in the shade, with 80% humidity, and the night-time temps don’t drop below 85 degrees for a couple months…your double-hung windows are not your friend…and that’s in a mild year. The Victorians here would have deployed air-conditioning with gleeful abandon. In the next room, hot and cold water are available at the twist of a tap, the hot provided by a state-of-the-art tankless natural gas water heater that is smaller than a picnic basket, and more efficient than any water heater in the whole history of the whole history. Meanwhile, I have the information of the ages at my fingertips, the house itself can notify myself, wherever I might be, AND the authorities in the event of an intrusion, fire, or plumbing problem…and it can do so through it’s own wireless uplink to the world. It will also send a picture of the problem. High-tech video and sound can be found in the “men’s parlor”, bringing the news and marvels of the world to light at the slightest whim…and the “water-closet” would no doubt delight my visitor from the past…particularly in one of those “midnight forays” so often required. Those weren’t brought indoors here till just after WW2. Cooking and heating without hauling firewood or coal (both used here) and simply flicking a switch would be downright decadent…as would the ease of cooking and laundry. And refrigeration without hauling ice? Just wow. The new and practically maintenance free roof (theirs would have been cedar shake…which will last but requires significant bi-annual or more maintenance) would gain a nod of approval. We will update this house…we ARE updating this house…we MUST update this house. They fall down in modern times in favor of cracker-box tract homes and mind-numbing apartments, simply because most folks today cannot afford to maintain, heat, or cool them to a livable degree. The technology…the high-efficiency heat and air…and lighting and insulation…can change that if properly deployed. And…it can be done for the most part, maintaining that Victorian attitude. It’s not hard. This house is a Queen Anne…and had a radically different decor scheme in every room. Western/southwestern, flowers, what may have been Oriental (not much left of that to tell), and what could only be called art-deco, even though it was way before that, plain/beadboard, and more are all original to this single house. As far as decor choices…pretty much ANYTHING goes. We’ll restore what makes sense. Preserve what we like. Replace what we must…and we’ll make sure this house is practical and comfortable to remain in use (and thus, standing) for another century or more. Yep, we’ll do it with Victorian flair…but where we can’t, or it doesn’t make sense…we’ll add our own brand of flair without hesitation or regret. This is our home…and we don’t live in a museum. The Victorians would see what we do and embrace the technology and rejoice in the changes. This was their home…and they didn’t live in a museum either.